This weekend Stratford-upon-Avon has been the venue for a “daring new collaboration” between the RSC and Google’s Creative Lab to stage a real-time performance of A Midsummer Night’s Dream while simultaneously creating a digital presence in which anybody could join. The whole thing has been led by the RSC’s Artistic Director, Gregory Doran. Today’s big news events—riots, bombings, royal weddings—all become subject to this anarchic, multi-dimensional, multi-authored storytelling. About 18 months ago we started wondering if one could apply the same treatment to a fictional narrative, like a play? Could we bring a play out of the scenic world and into the real and online worlds? Could we generate the same storytelling impetus using Google+ as a platform? … A world of peripheral, unwritten parts occurring simultaneously within and around the main play. The performance began on Friday evening with the preliminary scenes of the play, and continued on Saturday night, or perhaps I mean Sunday morning at 2.30 am when they performed the main section of the play up to the waking of the lovers in the forest. Many of the tweets sent by people in the audience mentioned the magical effect of staging these scenes in real time in Stratford, hearing the dawn chorus of birds and seeing the sky lightening outside the Ashcroft Room. 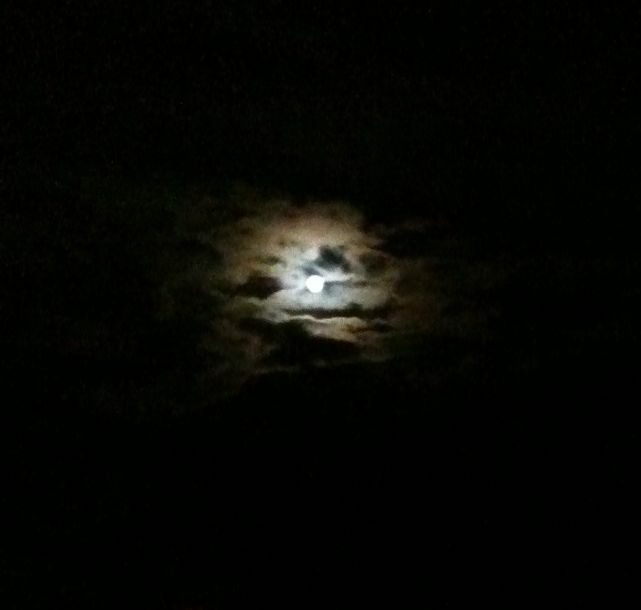 For me, just before “deep midnight” on Saturday, when Lysander and Hermia were due to be making their fictional escape from Athens, I spotted the full moon through the clouds. 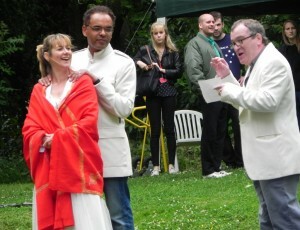 On Sunday afternoon I joined the throng of people in Avonbank Gardens and the Dell for a performance of Act 4 Scene 2, in which Bottom returns to his fellows, and for a rehearsal of the final act in advance of the performance scheduled for 11.30. Inevitably, rain stopped the rehearsal before the end, after an afternoon plagued by mostly grey skies and blustery wind that snatched the words from actors’ mouths. The play was continued at 11.30 pm and as they reached the end of the mechanicals’ play the bells of Holy Trinity Church just over the wall chimed the hours. This has all been great, and the magic of performing this play in real time in Shakespeare’s Stratford makes it an event very much worth repeating. The RSC has brought in some of its most polished performers including Peter de Jersey, Alexandra Gilbreath and Mark Hadfield. But it will be interesting to see how it is regarded as a digital event, or as a hybrid digital and real-time event. As John Wyver has pointed out in his second post, there doesn’t seem to have been the sense of a conversation going on in the online exchanges. I was pleased to receive photographs on Google+ of the play taking place during the night, but they didn’t draw me in. I only felt part of the event when I actually went along to the afternoon staging. Several of the online responses commented on how much they wish they were in Stratford. And John Wyver quotes a tweet he received asking if the web presence has been just “digital candyfloss”. 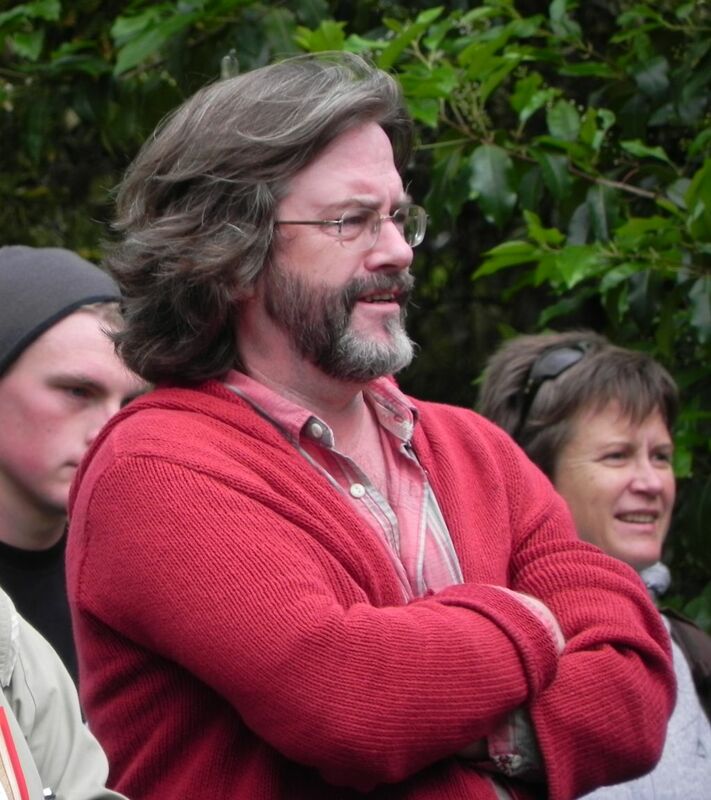 Here’s a link to Pete Kirwan’s response to the online material. Midsummer Night’s Dreaming has been a step towards finding methods of involving new audiences who would never set foot in a theatre but love their smartphones. Where, I wonder, will this take us next? 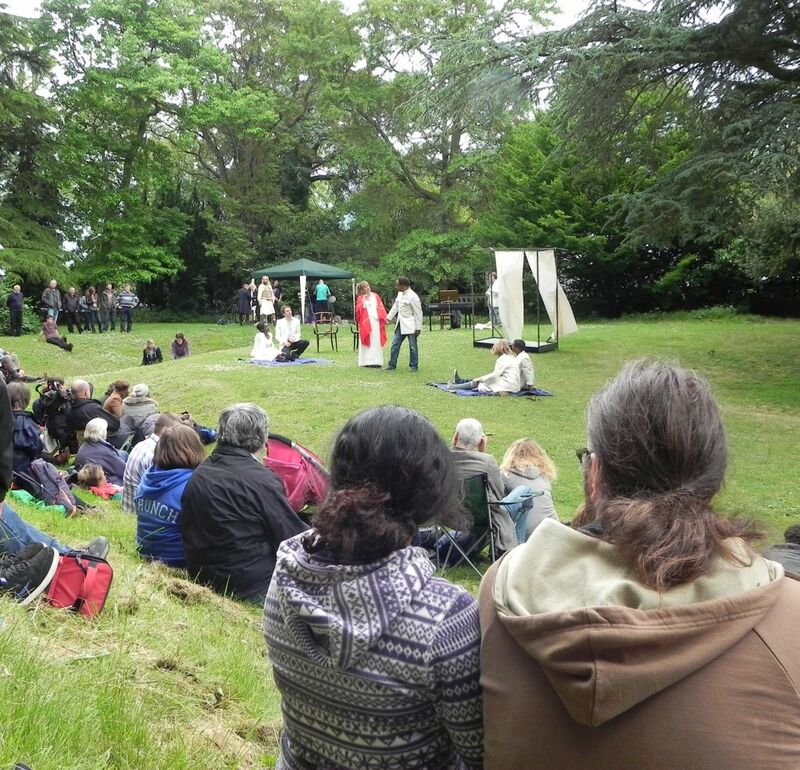 This entry was posted in Legacy, Shakespeare on Stage, Stratford-upon-Avon and tagged #dream40, A Midsummer Night's Dream, Avonbank, Gregory Doran, Holy Trinity Church, John Wyver, Midsummer Night's Dreaming, outdoor theatre, Pete Kirwan, The Dell. Bookmark the permalink. Sylvia, thank you for the thoughts. Just for clarification, can I say that while I am working with the RSC on other projects, for Midsummer Night’s Dreaming I have simply been an interested observer, watching like you both in the real world and online. Apologies, I misunderstood the statement in your blog post! Am amending my post accordingly. Thanks for putting me right. Thanks for the blog post and your interesting comments. Just a small correction. John Wyver wasn’t involved with the project, he’s working with the RSC on the live to screen events like Richard II later this year. Apologies, I misunderstood John’s comment on his blog, and am amending my post accordingly! 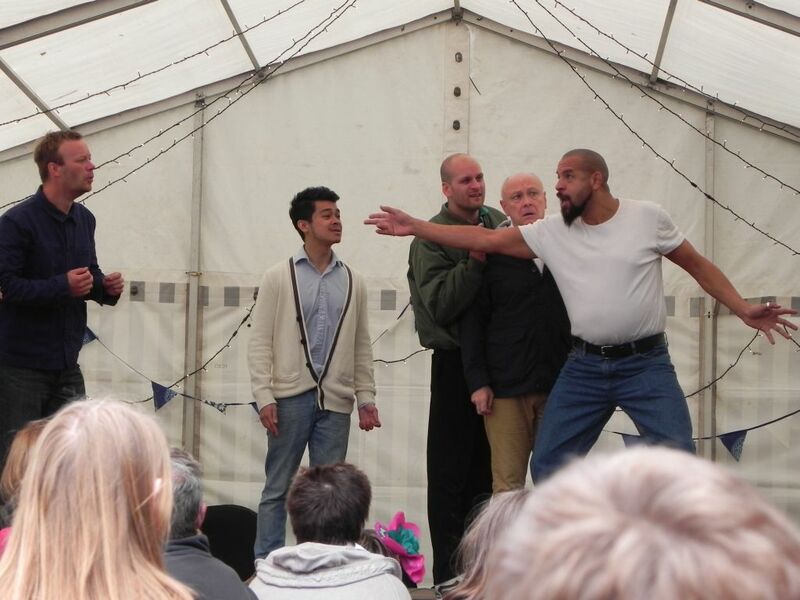 A full production of the Dream took place at the Dell on Saturday afternoon in front of an appreciative audience. GB Theatre Company previewed their new production ready to start their UK tour 2nd July at Norwich Cathedral. Pictures from the production can be seen on their site-www.gbtheatrecompany. Thanks for this information. Good luck with the tour!